Tonight on Crossfire; one of the nation's most controversial topics with no room to compromise: abortion. 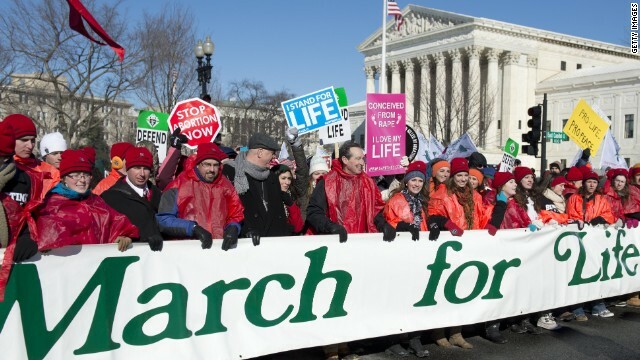 Today in Washington, there were thousands of people lined up to protest abortion at the March of Life. Is our country changing its views on the topic? Should it be? At 6:30pm ET. Lila Rose, founder of the pro-life group Live Action and Ilyse Hogue, President of NARAL Pro Choice America debate with Newt Gingrich and guest host Sally Kohn. We want you to weigh in on tonight’s Fireback question: Does a candidate's position on abortion impact your vote? Perot said it back in 1992 "Jobs getting sucked out of the country" – Many people saw it back then, but unfortunately too many people bought into the spin of "BS" that we were being sold. Seems that both parties were always able to distract and polarize voters with peripheral social issues like Gay Marriage and Abortion, which got most voters so caught up in the BS that they lost sight of the bigger picture. It's obvious isn't it. – But some people keep trying to feed us the Kool-Aid just to keep us distracted and polarized, so they can continue to sell us out. How about we take it a step further... mandatory hormone injections to all fertile woman. Request an interview with a government approved panel for eligibility to conceive, and if they see fit, temporarily take you off the hormones. Nobody will ever need an abortion again, wouldn't that be amazing? The key question about abortion is simple who is the judge??? Men have the advantage of pushing decisions upon the ladies even though we insist that ladies can't make decisions!!! Thus the abortion issue is hypocrisy on steroids, literally as once the urge hits a man thy will climb a mountain for satisfaction while the day after they will likewise climb another for escape. I contend that because ladies make the decisions to partner with a man the decisions afterward should also be made by the ladies as they are the ONLY people who suffer the consequences!!! And if she decides for whatever reason it was not right, the so be it!!! She is and always will be the best judge!!! @what1ever–Europe has more restrictive abortion laws than we do, doofus. @What1ever–doofus, Europe has more restrictive abortion laws than we do. This is why we have such a lousy Congress in this country - too many "one-issue" voters whose votes elect people who do not serve their own best interests, let alone the best interests of the country, but they still get votes because of their anti-abortion stand. While I completely respect the right of the Little Sisters of the Poor to not have to provide the birth control option... The continued argument that it infringes upon their religious right to be forced to sign a form to opt out is ridiculous. They have to sign a form to claim exemption from taxes as a non-profit organization, so why is that not an infringement upon this same religious right that is being used as a means to attempt to take down ObamaCare? Its all talk and beating of the chest to get your votes, but once they're in office you get the hand. Its such a waste of time and money. If you're Pro-Choice, good for you and yours and if you're Anti-Abortion...good for you and yours. NOBODY else needs or WANTS to know your personal views. I'm against abortion but it's not the key to my vote. Republicans are anti-abortion. All their right to life policies end at birth. If they were truly pro-life, they would do more to ensure the poor and lower middle class can eek out a reasonable existence with a livable wage that also provides all the basics every human being deserves....shelter, food, health insurance & care, transportation, decent education, etc etc. The religious right got whipped into a frenzy in order to create a voting bloc and it worked perfectly. The Republicans needed issues that would get people to vote against their own interests in every other matter, so gay marriage and abortion rights will be an endless debate as long as the parties need them to pry lazy Americans off their couches and into voting booths. Stop letting them use reproductive and civil rights as a tool rather than forcing them to deal with issues that matter to the whole country. You could do more to prevent abortions by advocating education and career's for women than by citing the bible. If "Abortion" drives your Republican vote, you're a fool. You're not saving lives; you're costing even more lost lives in the bigger picture. Why are we still debating abortion? Every other industrialized, western country takes reproductive rights basically for granted. Our country wants to keep company with places like Iran and Saudi Arabia instead of the U.K. and Japan. This show reminds me of why cnn is losing me little by little to msnbc. the motto should read "lean right". If a young woman gets raped, should she be required to carry her monster's baby for 9 months, while her hormones and body change to prepare her to care for it??? What does the Bible say about life? it says the breath of life (oxygen) is what brought "dust" to life. I do think a fetus that isn't gestated enough to breathe on it's own, or live in an incubator should be able to be aborted. Children should be wanted, not forced on women.